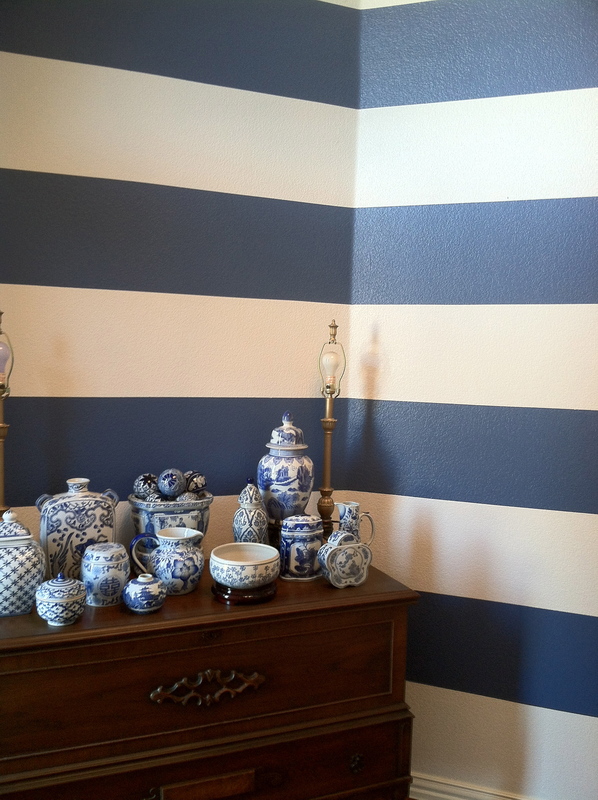 And The Stripes Have It! Gramps and I have been working on our new house for months now. It’s not really new, just new to us. In actuality, it’s very “unnew”. It has required a lot of fixing, patching, painting and repairing. Everyday the rehabbed parts are starting to look a lot . . . well, newer. Does any of this make sense? Anyway, the front hall is becoming one of my favorite “new” places in the house. It started out very bland, dark and dreary. 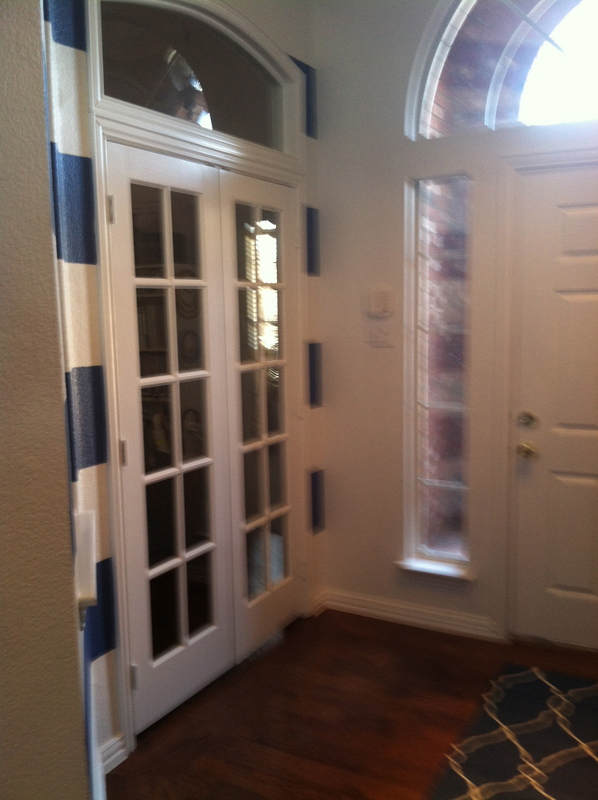 With the addition of paint, a new light fixture and french doors it is transforming into a truly beautiful foyer. First, let me introduce you to my chandy. She is big, beautiful and bodacious. She is so glorious, that I had to give her a name. Elizabeth. That’s right, I call my light Elizabeth. A regal name for a regal accessory. When my grandson Mac comes over, he asks, “Can we turn on Elizabeth?”. I find those words kind of strange coming from a 7 yo boy, but we don’t go there. Isn’t she great hanging from these tall ceilings? Next, you have to see the new door. Originally, there was just an arched opening to what was called the second living area. I think it was supposed to be a formal living room, since it has no closet and is by the front door. However, I use it for my sewing room. And therein lies the problem. My sewing room is by definition a work room, a project room, a . . . MESS! No way around it, it’s never tidy. So having said messy room right at the front door is a problem. Who wants to see chaos when they enter your home? No one, actually. So the solution was to add french doors to the opening. 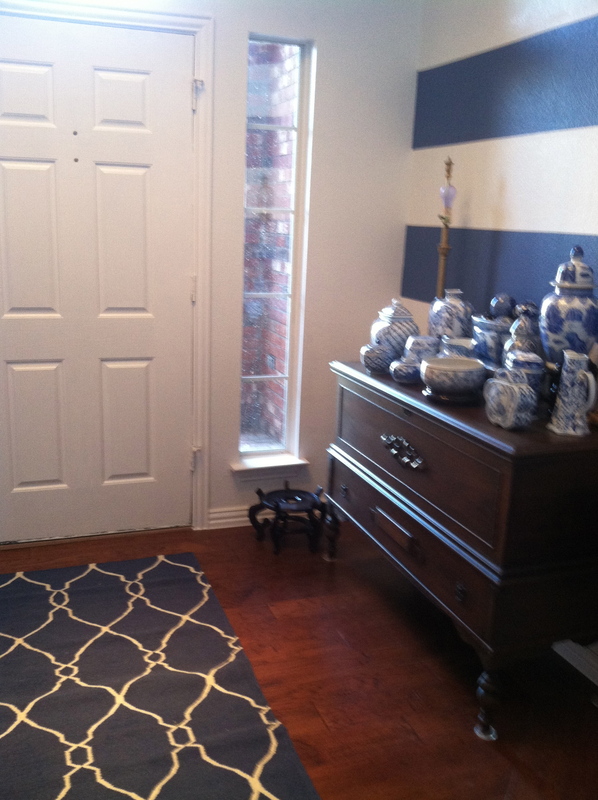 It gives a finished look to the hall without closing off the light to the sewing room. And they are adorable! (Sorry about the blur!) 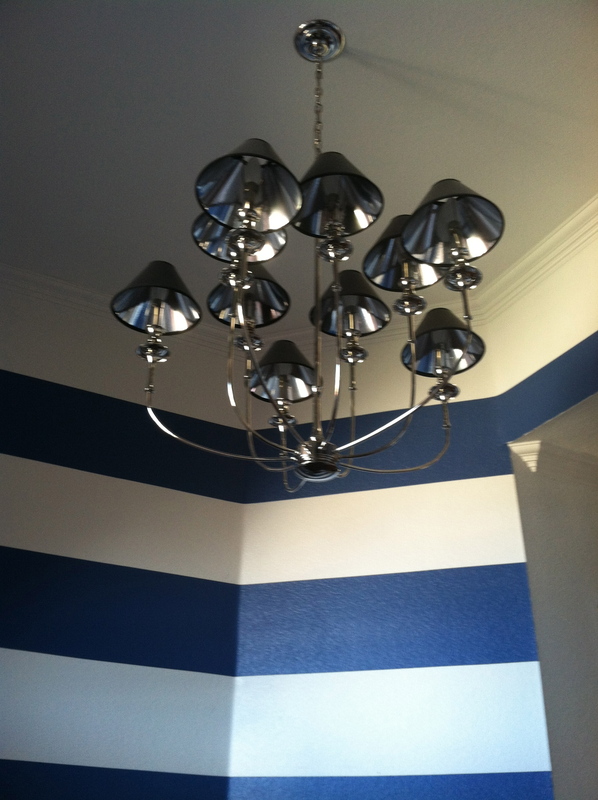 This little hall is actually a six sided space and I wanted to emphasize the shape, so I decided to use horizontal stripes. I got the idea from many visits to Pinterest boards online. Horizontal striping has become the new rage. Who knew? But I really like it. What do you think? The rug is going to look wonderful with all the blue in the area. I may even paint the door blue! Can’t have too much blue as far as I’m concerned! I plan to paint the lamps on the chest a platinum color. Also, thinking about painting the chest itself a shiny black. I will be putting blue/white plates on the walls and have some big pieces of ceramic for the floor in front of the chest. I am undecided about the small windows to the sides of the door for now. I’m sure some inspiration will come to me. For now, I’m just enjoying how everything is shaping up. Making any progress feels good. And, of course, anything blue feels fantastic! A couple came to look at our house recently. They commented that they didn’t care for all the “blue.” At first I was surprised. I mean, who doesn’t like blue? Then I was a bit angry. Critiquing my decorating so harshly is not nice. (Maybe I’m not as detached from this house as I thought.) Then I was hurt. And . . . I don’t know why. 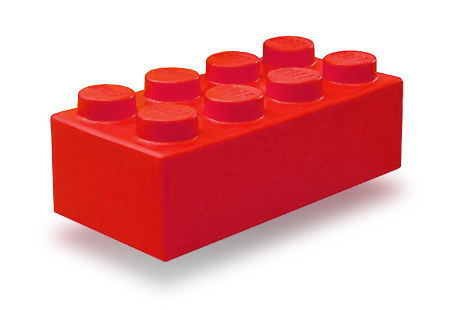 What is it about a color that we like or don’t like? Why do I love blue? I mean looooove blue? And obviously others don’t? 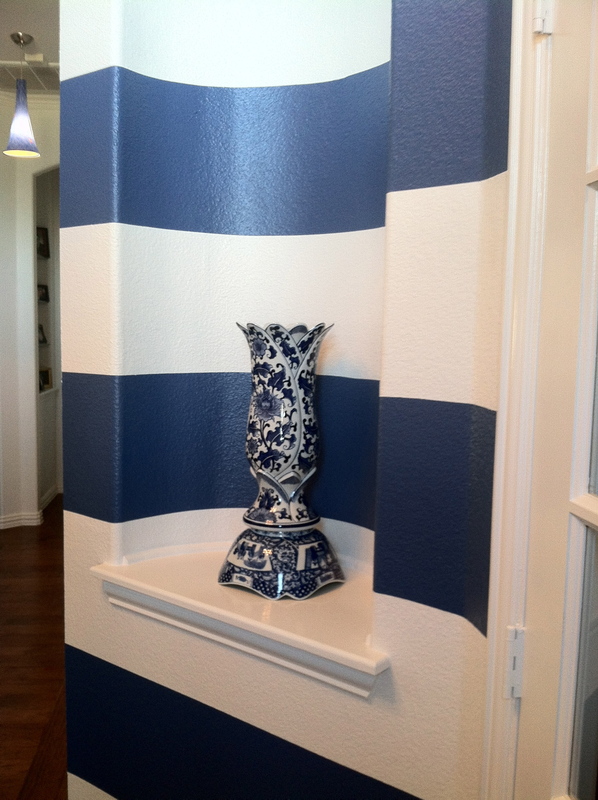 When Gramps and I first built this house, I loved blue, especially blue and white. I thought I would just indulge this budding fancy and then be done with it. 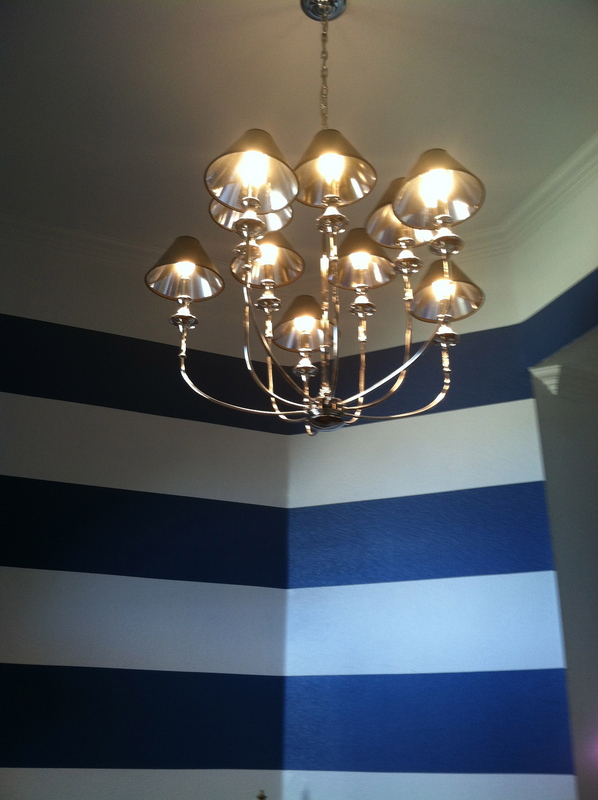 So I put blue in every room. 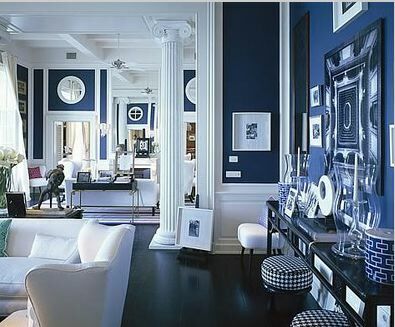 Some rooms are truly “blue” and others have only a touch. 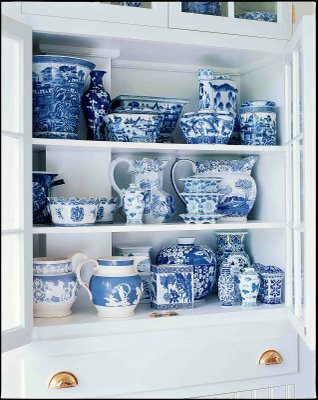 The kitchen is all- out blue and white with a collection of blue and white china pieces on the wall. That collection has grown and spilled over into a bedroom and a bathroom. I really believed if I let go and let my “blue” beast have her way, I would tire of it. Blue would lose its charm and I could move on to another world of color. But I have found just the opposite – I LOVE BLUE MORE NOW THAN EVER BEFORE! 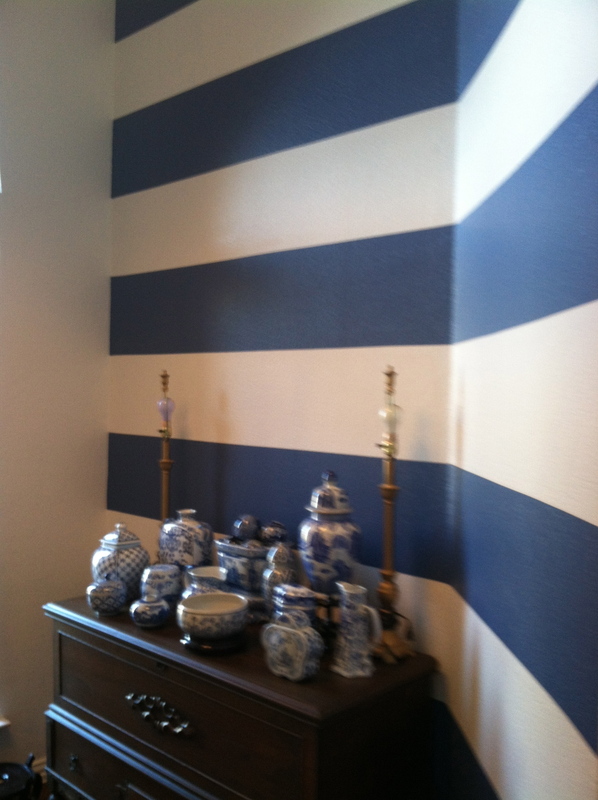 When I walk into a store, the blue and white combination always draws my eye, whether it’s china, furniture or clothes. I’m hooked! I’m addicted! 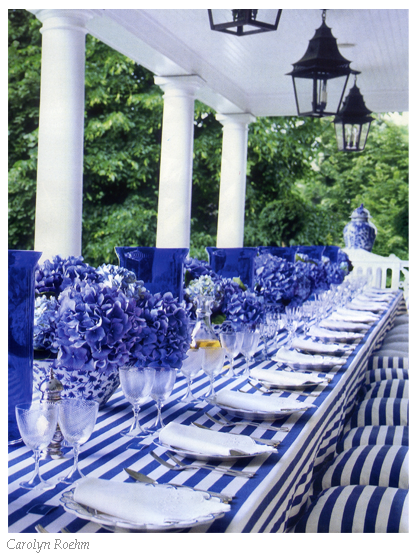 Be it stripes, patterns, polka dots or solids – blue and white is what I love! What I want! What I must have! Okay, okay. (Deep breath. Exhale) I still don’t understand why. I know colors affect our moods. Blue is supposed to be a soothing cool color, but it sure can get me excited. Why is that? Kids have favorite colors, even at very young ages. My sweet GD Katie loves pink and purple and has since she knew what colors were. And yet she asked for a green Easter dress. She’s young – only 4 yo. She still has time to become totally addicted like the rest of us. Now my 6yo GS #2 has maintained, “Red is my favorite color, you know.” for the last 3 years and has never wavered from that. I venture to say it will always be his favorite. He’s that kind of kid – very clear in what he likes, wants, knows. There’s just something about a color that makes us feel at home, safe, comfortable – that’s blue for me. Even though I have always maintained that every house needs a red room, for me, that room would be in a blue house. Being surrounded by blue, any blue, all blues, makes me happy. I even wear a lot of blue, not surprising. It’s a color that can say chic or country, crisp or soft, young or grownup. It’s my color. It fits me . I can’t seem to get enough. As hard as I try, there seems to be no point of too much blue. Not for me anyway. So now, I can let go a bit more of my house that I thought I already had. My colors are not everybody’s colors. That’s okay. Blue is not for everyone. That’s okay. 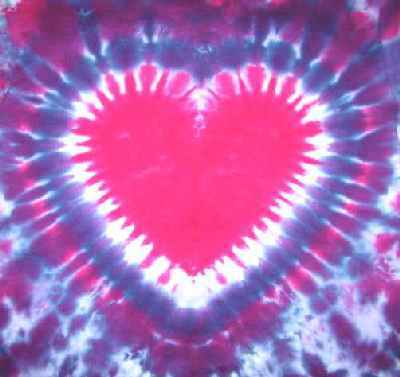 Each person may express their self and their love of color individually and with character. That’s okay. The people who buy my house can eliminate every speck of blue. That’s okay. I can make my next house as blue as I want. That’s okay. I still do not understand how color affects us as it does. But I do understand that it does. And that is very okay.